Attending pre-kindergarten has been shown to be one of the most predictive factors of lifelong success. Primary Colors comprehensive kindergarten prep program immerses children in active learning every day, preparing them to be ahead of the curve when they enter kindergarten—ensuring their readiness to success far into the future. 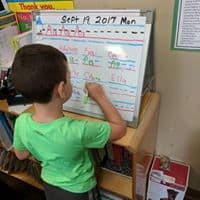 Kindergarten these days is much more academic than it used to be, and many children enter unprepared. In fact, over 200,000 kids repeat kindergarten every year. High-quality Pre-K education is essential to readying children for the next stage of learning and life. Based on research and proven results, our Kindergarten Prep program builds on your child’s earlier learning experiences, advance literacy, vocabulary, math, problem-solving, and fine and gross motor skills. 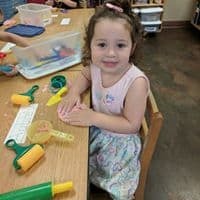 Independent and cooperative learning opportunities guided by our skilled, nurturing teachers serve to strengthen social skills, equipping your child to enter kindergarten with confidence. Our Kindergarten Prep program prepares children for kindergarten and helps them reach their full potential in life. Studies show that Pre-K graduates generally experience significant cognitive gains and score higher on math and reading tests than peers who receive no Pre-K education. They also enjoy greater levels of high school graduation, earnings, and overall lifetime achievement. 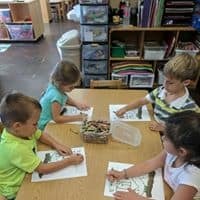 Cognitive: Responsive interactions, stimulating experiences and rich environments allow pre-kindergartners to develop emergent cognitive skills. With a firmer grasp on logic and language, children at this age benefit from creative, theme-based activities that prime them for the next stage of learning. Social-Emotional: Secure relationships with parents and teachers, observance of healthy adult behavior, and early positive social interactions influence social-emotional development. Opportunities to collaborate with peers and express emotions verbally rather than physically are beneficial to effective socialization. 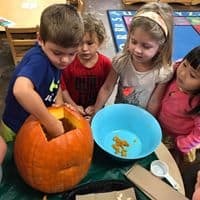 Physical: Active games and environments filled with building, dancing, painting, and activities to develop gross and fine motor skills as well as coordination and concentration are part of the daily routine for energetic 4 and 5-year-olds. Mastering Skills: Our Kindergarten Prep program provides a well-rounded education that emphasizes physical, cognitive and social-emotional development. Your child’s daily routine includes fun and challenging math, science, social studies, literacy, and physical activities. Building Confidence: Our Kindergarten Prep students are incredibly inquisitive. They express their new found independence through investigation, exploration and burgeoning decisiveness. Our teachers provide your child with many choices throughout the day to choose equipment, centers, and materials instilling confidence in each child. Confidence and Choices: Preschoolers are learning to define the world they live in and their role in that world. Throughout the day our program provides many opportunities to make choices allowing your child to navigate his or her surroundings throughout the day with confidence. Promoting Literacy: Your child’s classroom has a rich environment with words, language, and print which is the key to literacy. Your child participates in interactive learning to increase phonological and print awareness, narrative skills, and letter knowledge. Writing skills are expanded with the use of journaling. Learning Spanish: Your child is immersed in the words and world of the Spanish language. Whether playing make-believe, forecasting the weather, or cooking, your child is continually practicing this essential second language. Physically Fit: Learning good fitness and nutrition habits early can lead to a healthy lifestyle for years to come. Interactive exercises are a part of your little one’s daily routine, instilling the value of smart, healthy choices.